I decided to swatch a few of the purple colours I have to compare them to my benchmark purple, Make Up For Ever #92. As you can see, there is still no dupe out there. 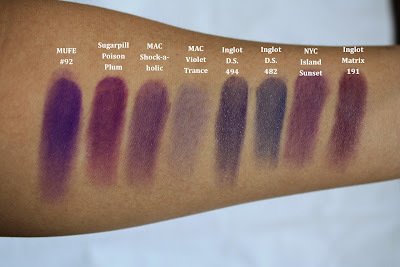 I also happened to find a dupe for MAC's Limited Edition Shock-a-holic eyeshadow, which is the purple from the NYC's Island Sunset Palette. MUFE #92, Sugarpill Poison Plum, MAC Shock-a-holic, MAC Violet Trance, Inglot D.S. 494, Inglot D.S. 482, NYC Island Sunset, Inglot Matrix 191. NYC Island Sunset Palette and MAC Shock-a-holic. This look is the one that I wore for my Big News video where I announced my Vlog channel and my shaved hair. You are goregous!! I love this e/s combo. Greens and purples are one of my favorite combos. I love the fact that you did the full application process. I wish people would do more like this ty girl. You look beautiful!